What is Fennel Oil ? 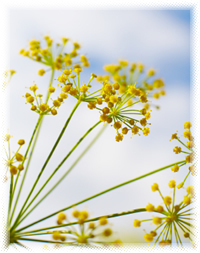 Sweet Fennel essential oil has a sweet, earthy, anise-like aroma that is warmly penetrating. It is steam distilled from the seeds of the fennel plant. Fennel has a balancing effect on the female reproductive system and increases the flow of body energy. It is used to improve digestion, sweeten breath, and used as a calming, antispasmodic for chronic coughs and bronchitis. Fennel oil is warm and soothing in massage blends and it helps to relieve muscular and rheumatic pains. A point of interest is that fennel is one of the plants that repels fleas, and if the essential oil is added to body blends, it can help to discourage insects. Fennel blends well with black pepper, ginger, geranium, bergamot, lemon, rose, cardamom, cypress, pine, tangerine, and sweet marjoram. It is exceptional in diffusers to clear the air. Diffuse it before and during meals to take the edge off your appetite, as it works for me this way. And try this fragrant blend recipe for a special Energy Mist. It is quick, easy, and delightful. Fennel essential oil should be avoided in pregnant and nursing mothers. The fresh stems of fennel can be eaten much like celery, the seeds add a lovely anise flavor to fish and other dishes. Fennel seed tea is an old fashioned remedy for weight loss. Botanical Information - Rituals & History : Fennel plants like plenty of sun and are adapted to dry and sunny situations that resemble the shores of the Mediterranean sea where the species originated. Fennel is best known as a culinary herb and all parts of the plant are edible. In medieval times, Fennel was hung over doors on Midsummers Eve to warn off evil spirits. Fennel Constituents: The essential oil is made up predominantly of anethole (50 to 80%), limonene, fenchone, and estragole. The seeds also contain fiber and complex carbohydrates.